On Tuesday April 4, internationally renowned opera baritone George Gagnidze held a workshop and master class at the University of New Haven. 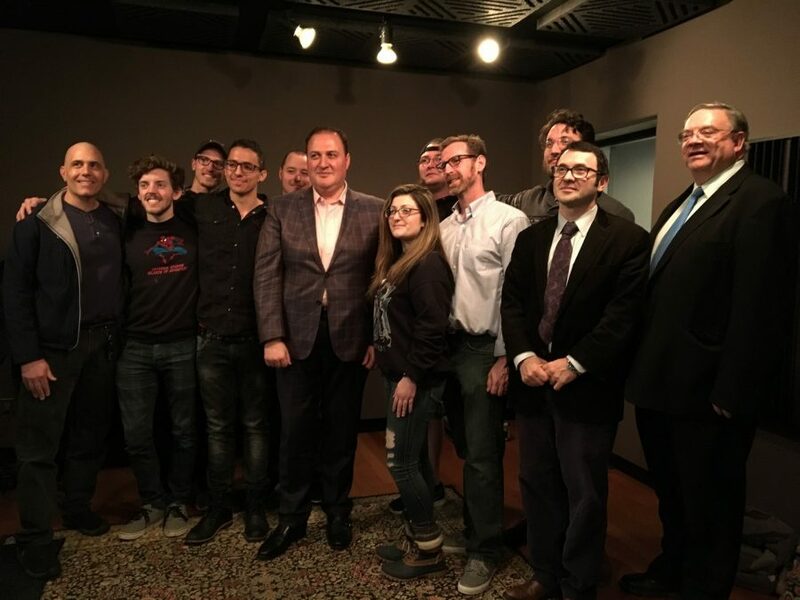 The first part of his visit was dedicated to music and sound recording students, and took place in the recording studio on the first floor of Dodds Hall. Following that, a masterclass was held, where six students, from both the University of New Haven and Yale University, had the chance to sing for Gagnidze and listen to his feedback in front of an audience in the Dodds Atrium. 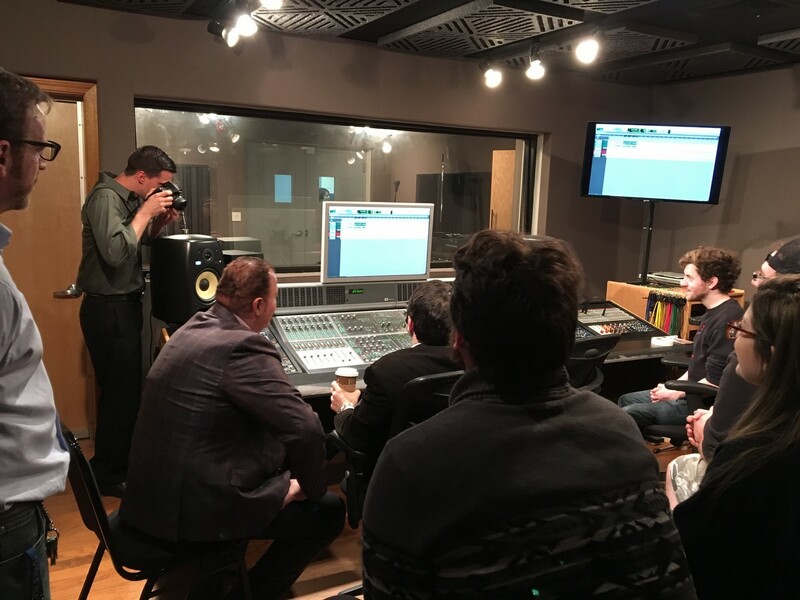 During the first portion of the event, music and sound recording students sat in as Gagnidze recorded sections of a piece in Italian. Students had the chance to record him; on a single take sung into two microphones, students showed Gagnidze the difference in the two microphones, and added sound effects to mimic the sound in a large concert hall. While listening to the different recorded takes, Gagnidze kept remarking that in the recordings, opera should sound smooth, because of how loud it typically is. Recording opera in a studio is unique, because it’s a much more intimate setting. “It sounds like it’s not from afar,” Gagnidze said. Austin Eskeli was one of the students who sat in on the session. He says recording Gagnidze was different from anything he’d done in the past; Gagnidze produced a lot of volume and Eskeli said they had to compensate for the fact that, although he spoke it very well, English is not his first language. Gagnidze said that since opera doesn’t use microphones to project sound, the best venues are the ones where there’s still an ability to create an intimate connection between performers and the audience. For the master class, Yale University students Zachary Johnson, Sylvia D’Eramo and Sarah Saturnino performed selections of opera for Gagnidze and the audience that had assembled to watch. Though the University of New Haven doesn’t have an opera program, three students performed for Gagnidze: Sarah Chrzanowski, singing a classical selection, and Kiera Terrell and Robert DellaCamera singing a musical theater duet. Gagnidze provided critiques of their performances, and gave them advice. DellaCamera found out a week in advance that he’d be singing for the opera magnate. Originally, he was going to sing solo, but his and Terrell’s voice teacher, Wendy Hillman, thought it would be less stressful if they sang together. Singing in front of Gagnidze was a little nerve wracking for him. “I have always thought that vocal masterclasses and singing recitals were so much more nerve wracking than being in a theatrical performance because everyone is focused on your every move,” DellaCamera said. Overall, he sums it up as “an incredible experience.” Though Gagnidze wasn’t familiar with The King and I, or musical theater in general, he still offered some advice and tips on how to strengthen their performances. Gagnidze thinks opera generally enriches people. As a child, Gagnidze liked to sing, and “my voice was discovered from there.” He has won international singing competitions, and is known for his strong performances and commanding presence on stage. He made his Metropolitan Opera debut during the 2008-2009 season, as the title role in Giuseppe Verdi’s, Rigoletto. Since then, he has appeared in every season at the Met; he is currently playing Amonasro in Aida through April 20. Gagnidze’s visit to the University was the first time he’s worked directly with students in this manner. Roger Cooper, a member of the university’s Board of Governors, approached him about the visit. “I wanted to share my experience with students,” he said.